It seems there is no reason to call it not “the world’s longest pure electric bus”. It wasn’t an April Fool when BYD announced to launch its 27 meters long K12A on 1 Apr 2019 able to transport 250 passengers without emitting carbon dioxide or other noxious fumes. BYD, a Chinese automobile manufacturer based in Xi’an, Shaanxi Province in China, caused quite a stir in the media. According to BYD, K12A is not only the world’s longest pure electric bus. It is also the first electric bus equipped with a four-wheel drive (4WD) – able to torque to four of its wheels simultaneously. If that isn’t enough, the bus can even switch between 2WD and 4WD. This allows to meet the terrain requirements and optimize the vehicle’s overall energy consumption. The BYD K12A, featuring an all-aluminum alloy body, can achieve a maximum speed of 70 km/h. Allegedly, it is possible to cover a distance of almost 300 kilometers with one battery charge, enough for a day trip. K12A is not the first pure electric bus from BYD. With its K9, the Chinese automobile manufacturer was even the first company producing the first world’s pure electric bus. 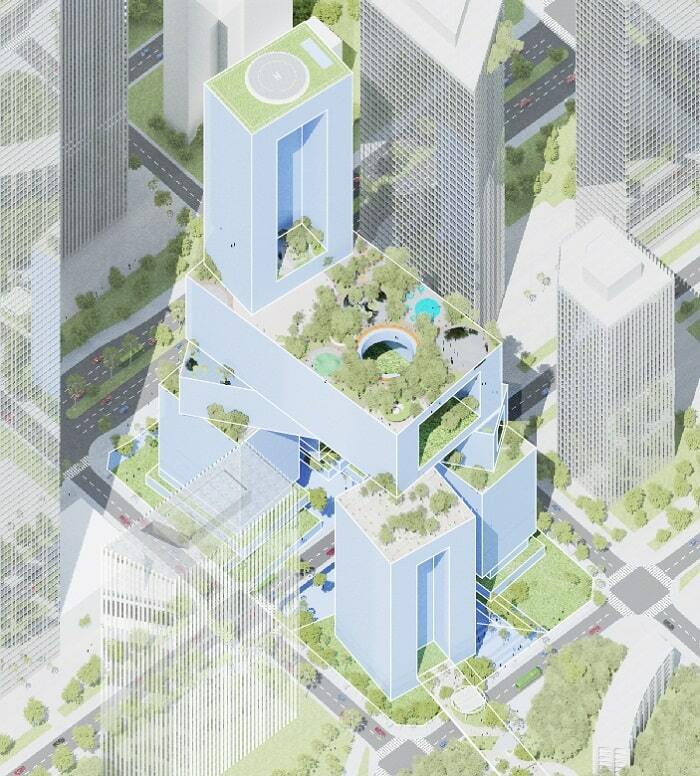 Dutch architects MVRDV are the winner of the design competition for the new headquarters of the real estate developer Vanke Group in Shenzhen, China. 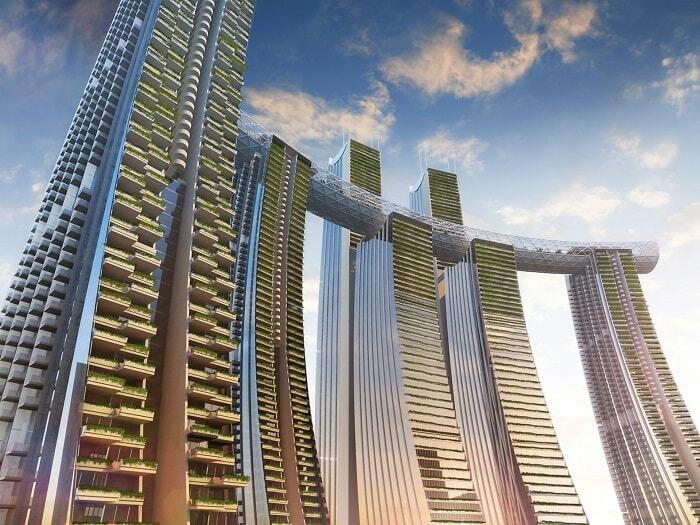 Unofficially called ‘Vanke 3D city’ by MVRDV, it is the latest of architecture of the future. 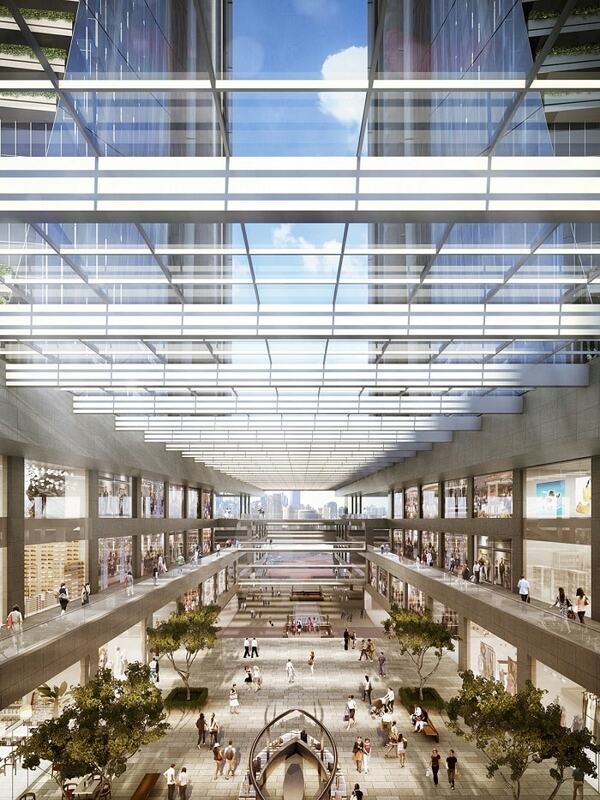 Built on two plots of land on either side of a road, the Vanke Group’s headquarters building will be a dynamic, mixed-use development, composed of eight blocks that bridge the road and connect to each other. 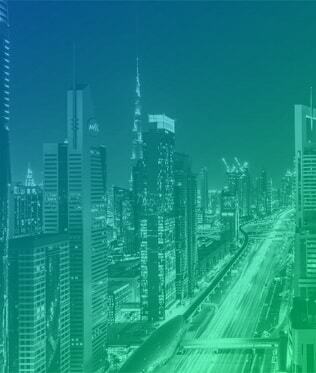 The tallest tower counts 250 meters. 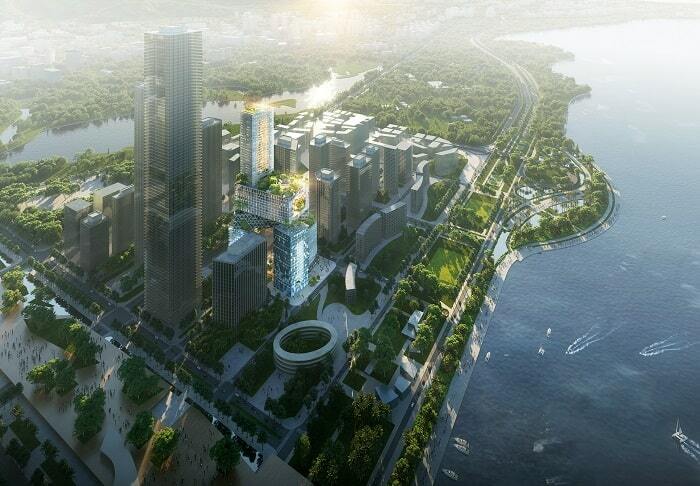 The 167,000 square meter development will house office and retail space, parks, restaurants and a hotel. 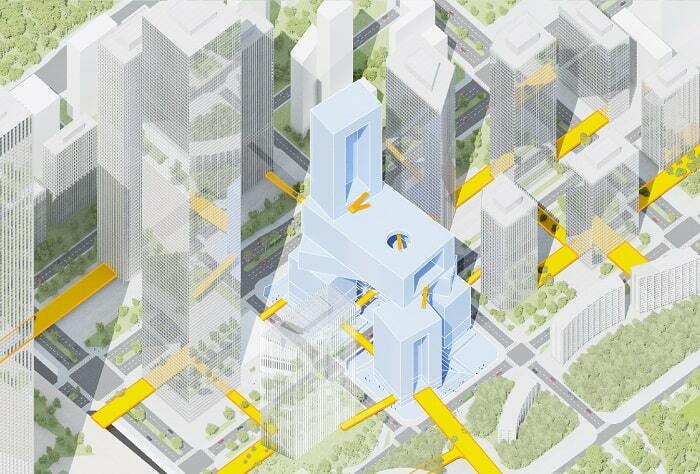 The concept of the ‘three-dimensional city’ evolved from MVRDV’s Vertical Village project of 2009, which examined how cluster developments can contribute to sustainable social dynamics in dense urban environments. Each block will be designed to correspond to one of Vanke’s core values: ‘health’, ‘energy’, ‘open’, ‘team’, ‘green’, ‘nature’, ‘future’, and ‘creative’. 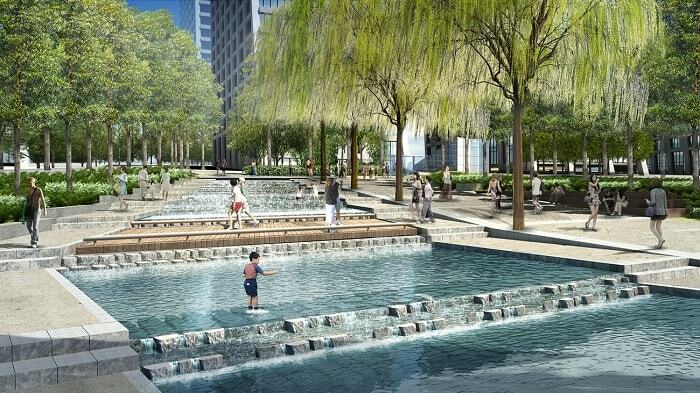 In addition to the large amount of green and open spaces that will be incorporated, the design includes systems for water collection and recycling. Four of the blocks will be indented either on one façade, or all the way through the block, creating ‘windows’ that will house atriums, parks and plazas. The roofs of each block will also feature green spaces to be used as recreational areas. With all of the gardens and halls connected by stairs and elevators, the linked blocks will create an entirely new kind of urban cohesion and continuity. 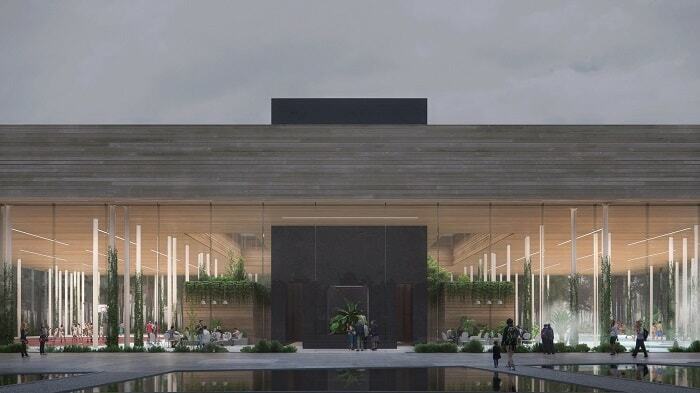 The network of shaded, airy spaces will be open 24 hours a day, giving Shenzhen residents a welcome respite from the tropical climate and access to the commercial and restaurant levels at the base of the four corner blocks. A sunken, multi-level green space at the base of Vanke City also forms part of the network, and in accordance with Shenzhen’s ‘sponge city’ program, it will help to facilitate water drainage to prevent flooding, thereby lessening the city’s effect on ecosystems. 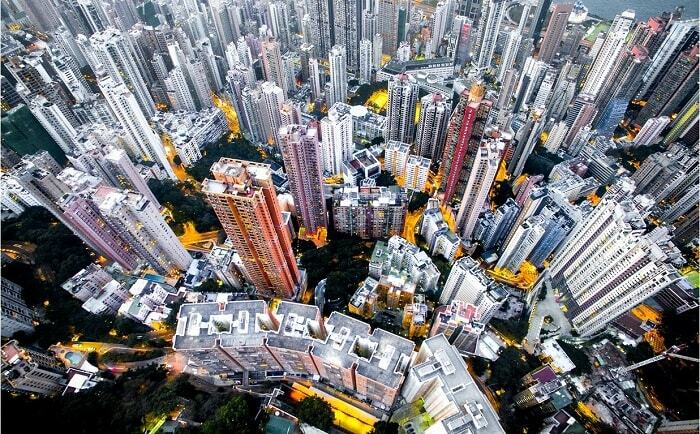 When you think of Hong Kong you probably think of densely packed skyscrapers, a lot of glass, steel, and concrete. But what about urban green spaces? 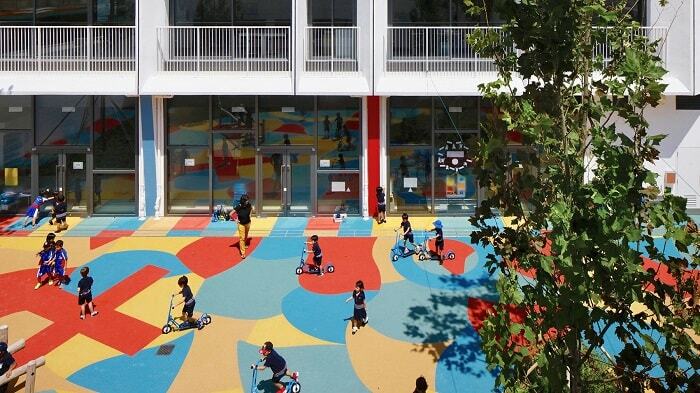 Now, the new French International School is set to provide, not only a green oasis in a city environment, but also an example of sustainability. 42 well-grown trees have been planted around the school grounds, and a 400-meter-long walk takes students on a tour of the native plant species that might occur within a natural South China forest environment. But the green theme doesn’t begin and end with the landscaping, unusual as the island of greenery may be. The campus has been designed for sustainability. Architects Henning Larsen say that everything, from the choice of building materials to the orientation of the building and the way the windows are designed, targets sustainability. The company hopes that both students and local builders who were involved in the project will learn important lessons in sustainability from the building. 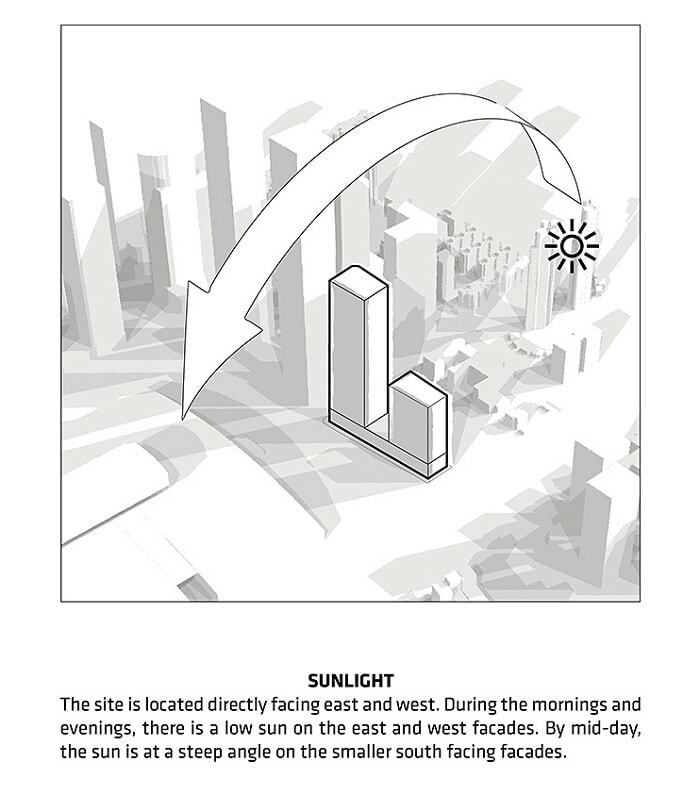 The orientation of windows has a big influence on the indoor climate, and the architects chose North and South Orientations to prevent the sun’s rays from penetrating directly into the building during the early morning and late afternoon hours. In addition, the windows are shaded with brise-soleils (features that deflect the sun’s rays) to prevent too much of the hot, tropical sunshine from shining in, raising indoor temperatures to uncomfortable levels that would call for increased use of air conditioning. 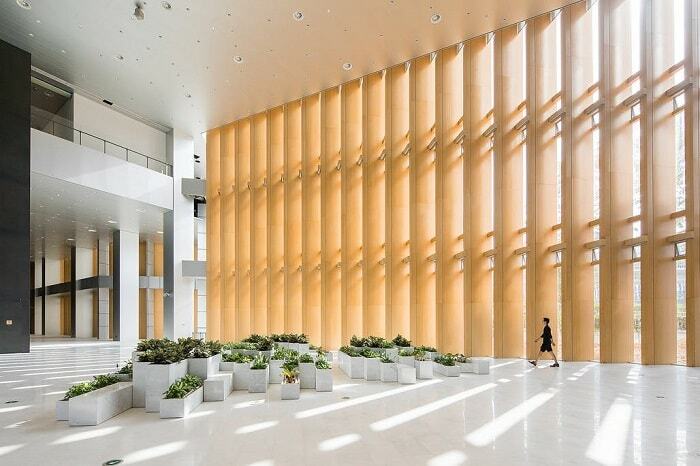 The company says that its choice of brise-soleils also allows for better penetration of natural light and reports that its design has allowed for homogeneous light distribution throughout the building. 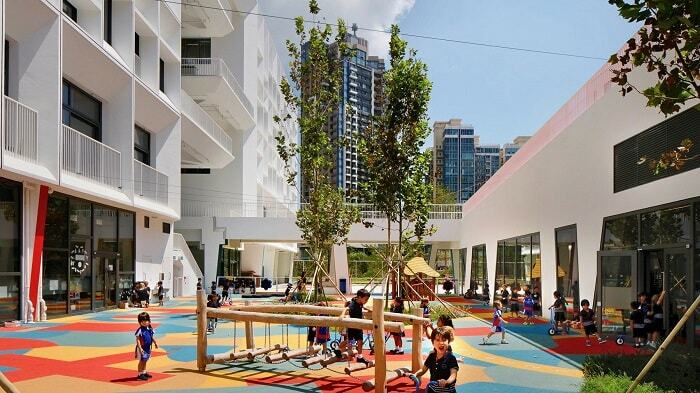 “We dissolved the traditional classrooms, and we pushed boundaries on how learning spaces can allow teachers and classes to work together in a more collaborative open space,” says Claude Godefroy, Design Director, and Partner at Henning Larsen Hong Kong. 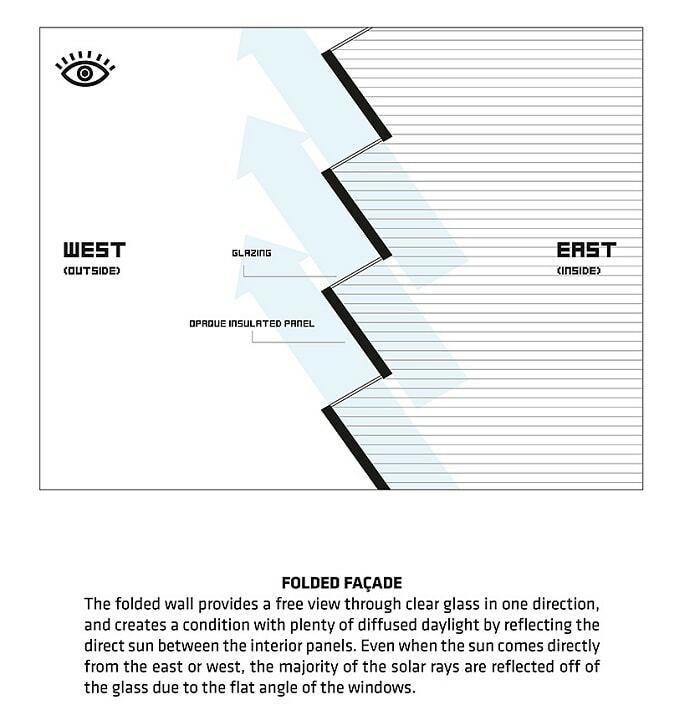 It’s not only the window-design that helps to keep the building cool. Ventilation systems are arranged to take advantage of natural breezes to bring fresh air into the building – and it’s hoped that the gardens will contribute to the purification of the air. People, their education, and their attitudes towards diversity are also important to sustainability, and the school hopes to bring its international and French students together as part of the learning experience. To facilitate this, there are no individual classrooms. 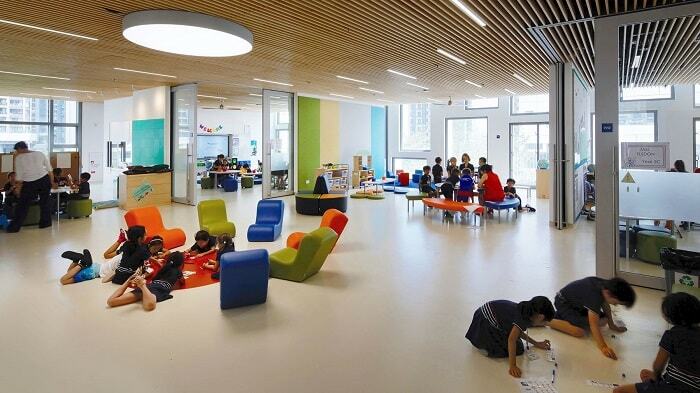 Instead, students learn in open-plan spaces that can be opened up to neighboring classes for collaboration and group activities. With the French International School offering classes to students from 40 different countries in five different languages, children will have no difficulty connecting with their peers from around the world in this multicultural environment. It’s not only the school’s student-body of over 1,000 primary and high school students who will benefit from the new building. Henning Larsen says that community inclusiveness is assured thanks to the option of keeping the school’s ground-floor facilities open after school hours. 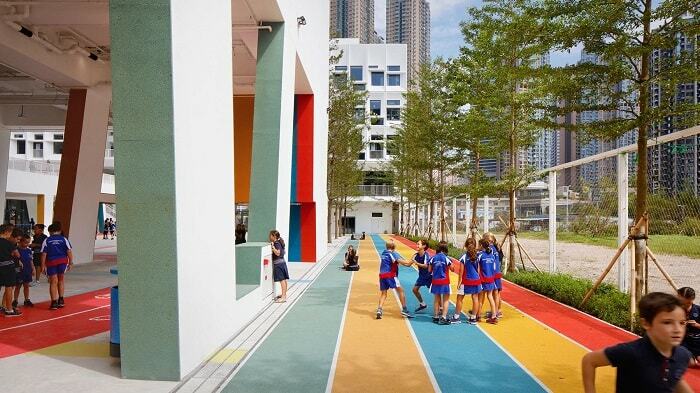 These include a gymnasium, an exhibition space, a canteen, and the school playground with its attractive green space. 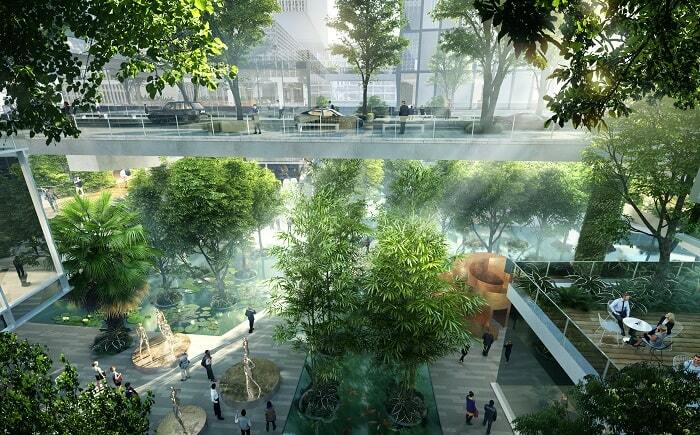 With greenery being at a premium in Hong Kong’s urban environment, residents will be able to benefit from the tranquillity of the gardens after hours and over weekends. 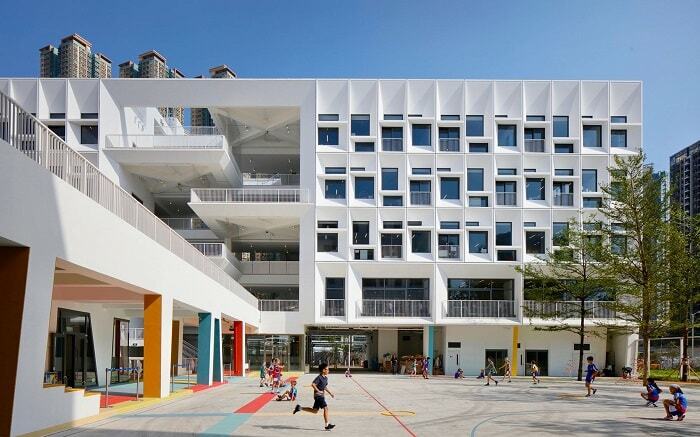 The French International School in Hong Kong is not only designed to be the greenest school in the city, but it’s also a space that celebrates every aspect of sustainability. 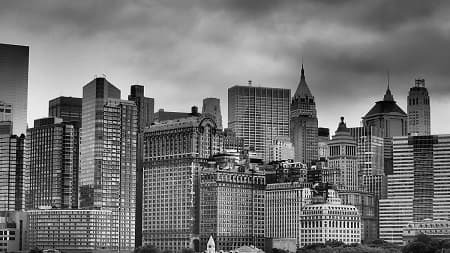 Its architects believe that it will benefit people directly and they hope to provide an example of the advantages to be realized through sustainable buildings, even when they are in the heart of urban environments. 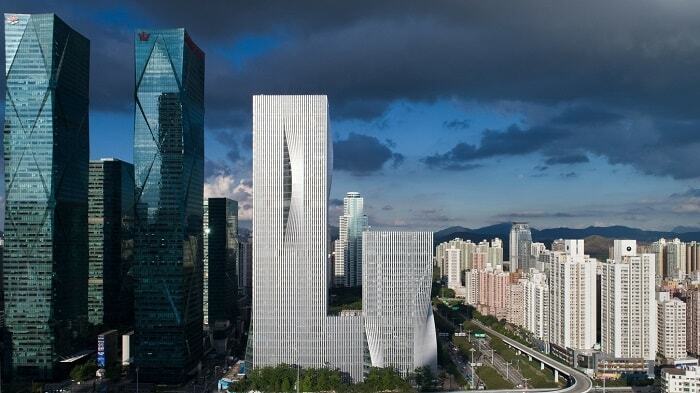 The growing Raffles City Chongqing complex boasts several firsts for China and the world. It’s crowning glory, a 300m “horizontal skyscraper,” set atop the tall, residential and commercial towers, is certainly among the biggest talking points. So much so, that the hoisting of its first section was televised live on prime-time Chinese television. The complex, consisting of eight towers, four of which are joined by the accordion-shaped upper conservatory area, and a lower podium featuring six floors of retail space and a transport hub, comprises a total of 1.12 million square meters. The upper skybridge is the world’s highest and links the world’s greatest number of towers besides offering a unique community space. Construction of the new urban complex takes five years, but the structure is not only impressive from the inside. The curving façade represents a tribute to the sailing boats that plied the Yangtze River and Jialing River, and the two rivers converge at the site of the waterfront property chosen for the Raffles City Chongqing complex. With such a setting, it was natural to make the most of the potential for magnificent views over the city and the water, and the upper conservatory offers the ability for 360-degree enjoyment of the panorama. 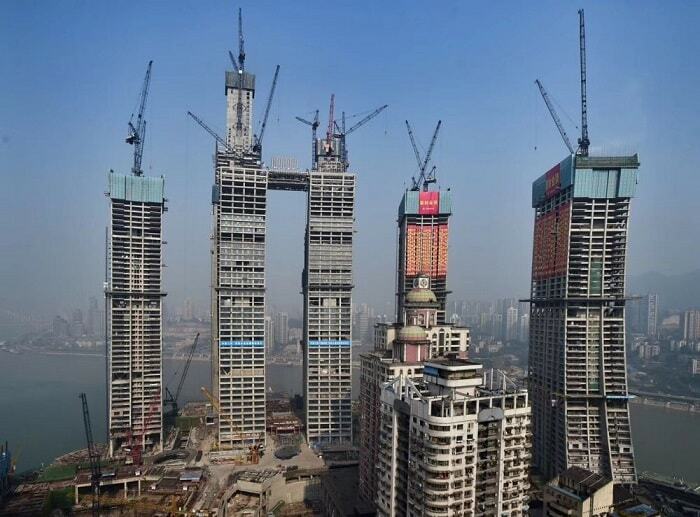 Singapore-based CapitaLand Limited, the company responsible for the construction of Raffles City Chongqing, says that the structure and its horizontal skyscraper conservatory mark a global milestone in construction and structural engineering.  The building has certainly received accolades on all fronts, specifically with regard to its livability, connectivity, and sustainability. Raffles City’s designers, Safdie Architects, thoroughly studied the significance of the site to Chongqing before embarking on a design concept that strove to reflect the city’s aspirations while meeting the needs of its people. 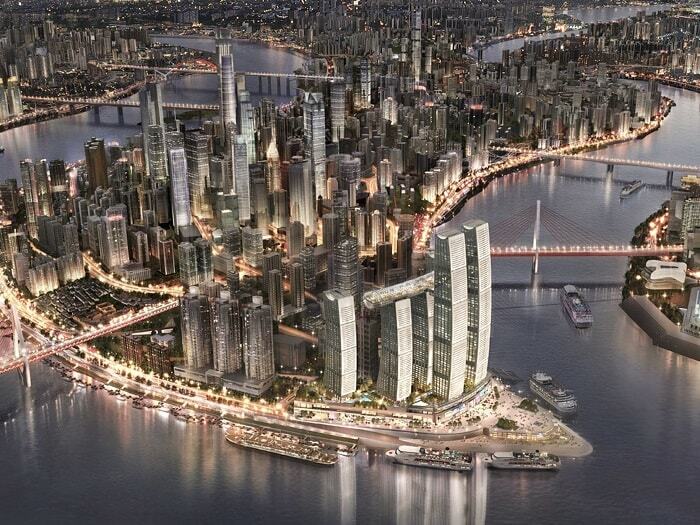 More than just a building, or even a complex of buildings, Raffles City Chongqing represents an urban district. The upper conservatory area won’t be reserved for the select few. 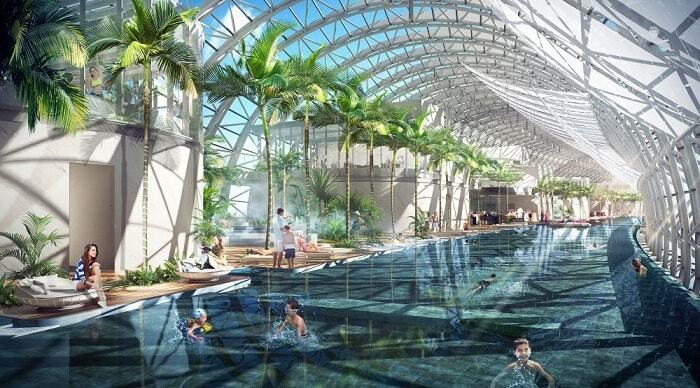 Instead, it will serve as a hub for civic activities and public recreation. It features an infinity pool, a patio observation deck with transparent glass flooring, a sky-high green space, and dining amenities. 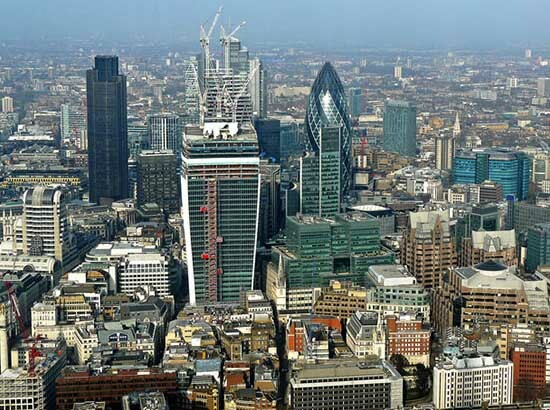 Meanwhile, residential, office, and hotel spaces in the towers are selling fast as the project nears completion, and its developers say that the complex will begin a phased opening process in 2019. The horizontal skyscraper that represents the most remarkable feature of the complex spans four of the eight buildings and is connected to a further two of the eight towers by cantilevered skybridges. 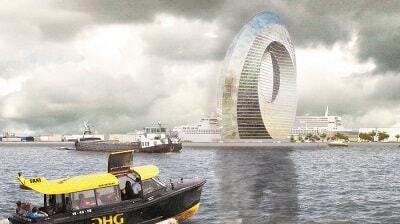 The entire project can be seen as, of course, a further impressive South East Asian lighthouse project. Raffles City Chongqing is impressive at a glance, but there’s more to it than meets the eye. The structure presented engineering challenges owing to its exposure to high winds as well as vulnerability to seismic energy. This was overcome through the use of frictional pendulum bearings and seismic dampers allowing the complex to absorb energy through flexibility rather than attempting to overcome stress through rigidity. 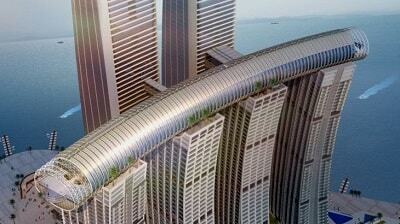 Energy efficiency also forms part of Raffles City’s ethos. The retail plaza makes extensive use of natural light, and the overall energy efficiency of the complex has resulted in it being awarded LEED-CS Gold Certification by the US-based Green Building Council. 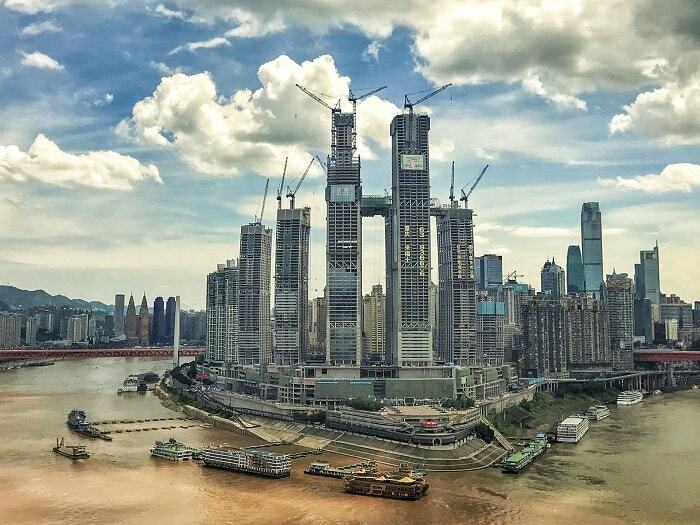 With Raffles City nearing completion, Chongqing looks forward to the opening of a complex that will not only raise its international profile with a notable landmark but also meet the needs of city residents and commercial concerns. And, when busy city life becomes stressful, the horizontal skyscraper conservatory will offer a welcome retreat for those who wish to rise above the bustle for open space, greenery, and enjoyment. The construction of a unique building according to Bjarke Ingels’ winning design for the Shenzhen Energy Company in China has been completed by its subsidiary BIG. In 2009, the design was selected the winner of an international competition in which participants were asked to design a sustainable head office for the Shenzhen Energy Company. Construction is now complete, and the building opened its doors in August 2018. 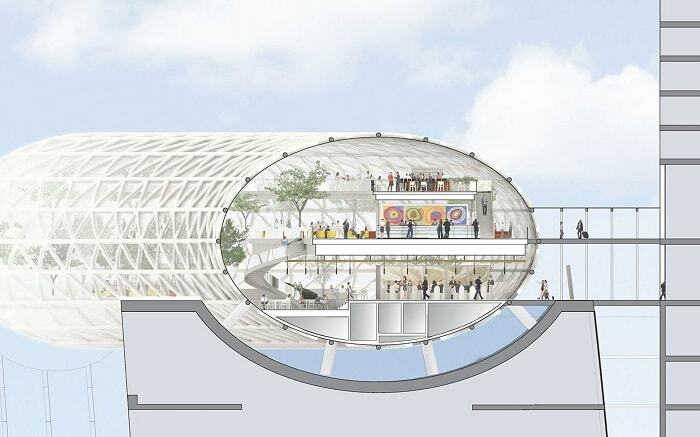 Its interior includes cafeterias, meeting rooms and exhibition spaces as well as office space for rent. The Shenzhen Energy Company occupies the upper floors. The building features several novel sustainable design features which its architects describe as “engineering without engines.” Its building envelope has been developed to allow maximum use of natural light without glare as well as taking other external elements such as wind and humidity into account. 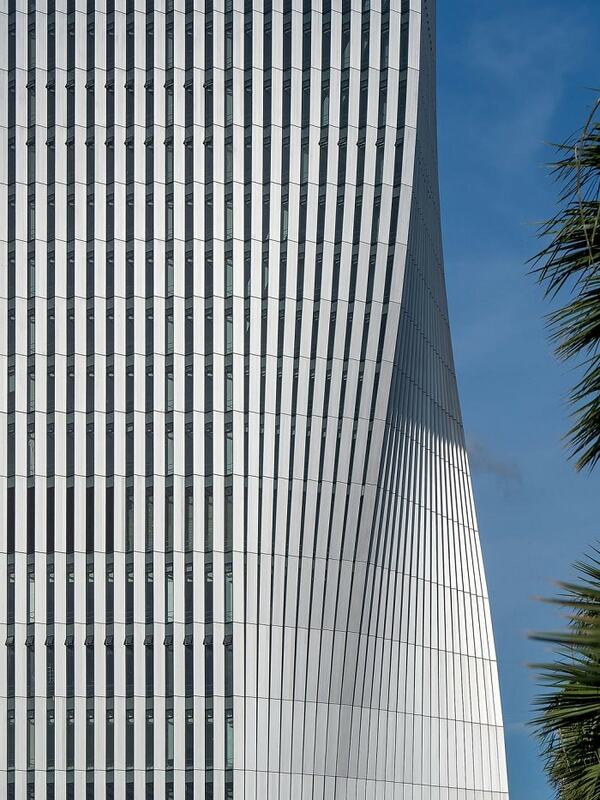 The sinuous, aesthetically pleasing, rippled and pleated appearance of the building is also highly functional. It was developed to provide a comfortable workplace environment in the subtropical climate of Shenzhen while reducing the energy demand for lighting and air conditioning that a building of its scope would ordinarily have. The building consists of two towers joined by a lower podium. The folded outer walls, which give the building its pleated appearance, allow for striking views over the city coupled with improved insulation. 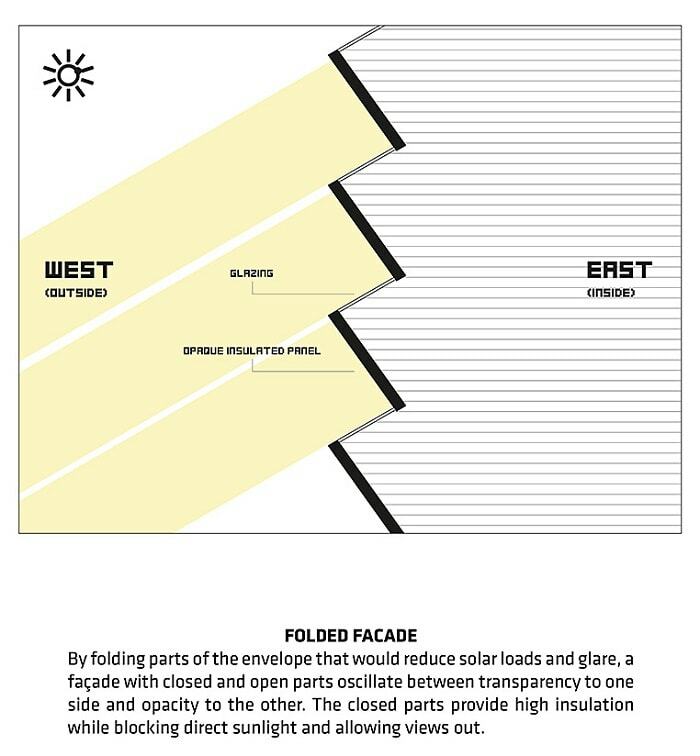 The folds of the building envelope are oriented in such a way that harsh Eastern and Western sunlight in the mornings and afternoons will reflect off the glass of the windows. The result is bright, diffused light and an airy interior with reduced need for artificial lighting and air conditioning. Both towers’ rooftops and the connecting podium provide space for three urban parks that create a much-needed space for relaxation in green surroundings as well as additional insulation for the building. This new complex represents the first time that “folded” walls have been used to improve energy efficiency, and the concept has the advantage of simplicity. No complex machinery or moving parts are required for the building to make the most of natural daylight without heating the interior.